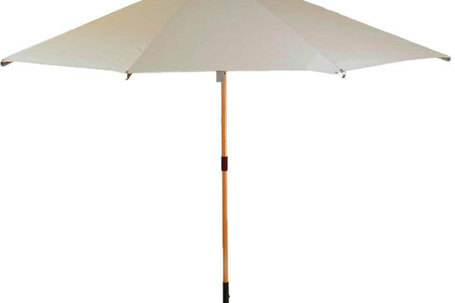 Simply the finest timber market umbrella’s available. Terrazzo Deluxe frames are manufactured from plantation grown Saligna Hardwood, certified by the internationally recognized Forest Stewardship Council. The Natural beauty of the timber is enhanced by a protective clear lacquer. The Terrazzo Deluxe Collection features clean & durable stainless steel hardware, including rib ends, spiders, lower pole sleeves and pulley systems. Fabric is Sunbrella the legendary 320gm solution dyed acrylic that will almost literally never fade. Medium Concrete,Granite or Steel Umbrella Bases.